Sign and Verify a message given, so as to prove ownership in GUI. Back-up your wallet data in GUI. Build versions expansion, Launchpad, snaps, etc. Review Orphan chains / sync fix, increase temp memory. Test of 0.13.x updated version with AFBs work on the new High Resolution version of Feathercoins custom icon set and GUI fixes. Linux kubuntu with Breeze theme. AFB and I have done some work improving / customizing the 0.13.1 wallet overview screen. It includes displaying the high resolution Logo and adding the status bar divider to improve the wallet look. We’ll push it to this dev fork later today, if anyone can do some test builds especially for windows and MAC. The basic structure is now there, some fine tweaks / further hi res images / testing still being done. This is a build script for incompatible database, (backup up your dats before testing with this build or version, or compile with bdb-4.8++dev. ./configure --with-gui=qt5 --with-incompatible-bdb --enable-tests=no --enable-upnp-default --enable-shared --disable-hardening CFLAGS="-fPIC"
Hi Support, Just to let you know. 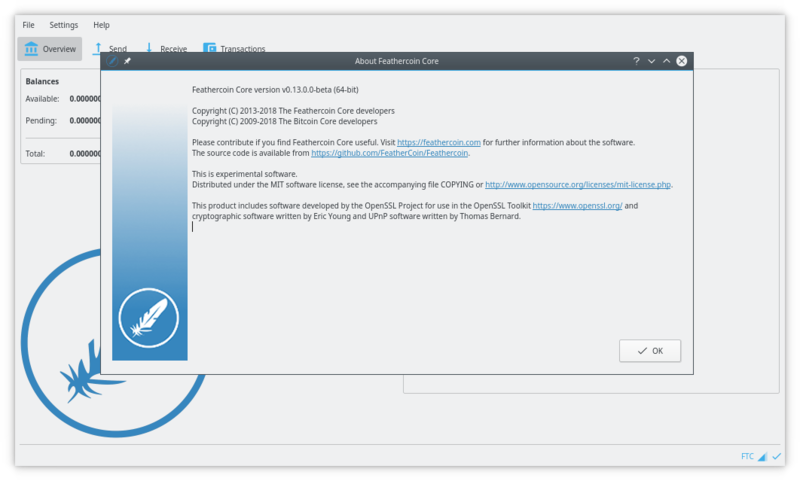 There is a new version of Feathercoin software based on 0.13.0. software branch. FTC developers have customized the daemon software so it has a number of enhancements for pools / exchanges, in particular specific rejection of non FTC communication from other coins. The new version will have new facilities via a SegWit and a soft fork. These will be officially announced once an updated GUI is completed there will be further minor releases. Re: Paper Wallet option for 0.13.1. @Lizhi - I have imported (by hand) the paper wallet into 0.13.x. I have fixed a number of things missing / changed (rpcserver). AFB is doing / has done a high resolution print icon required for it. However I’m stuck on a build issue. I think the code is reliant on something in comments, coin control or some other previous commit or change from 0.11.x to 0.13.x. I will do a push to here, if any can have a look, just to see if it something stupid (for a proper programmer). I’ll post when I’ve factored a push from my build folder. Where is the option to change to the dark layout…?